Hi everyone! Sorry I’m a little late with last weeks post. I’ve been working on perfecting my earl grey peaches and cream recipe, however it’s still not quite where I want it to be. Tropical green smoothie has therefore jumped in to save the day. Thank goodness! I want go over all the ingredients in this recipe, however it's passionfruit season in New Zealand and I am currently in love with this beautiful fruits refreshing flavour and unique texture. If it's not passionfruit season where you are, simply garnish instead with your favourite superfoods. I also have a sweet spot for coriander/cilantro which I know, is not everyones cup of tea. If this is you, just up the amount of leafy greens. Blend all ingredients, excluding the passionfruit, in a high speed blender. 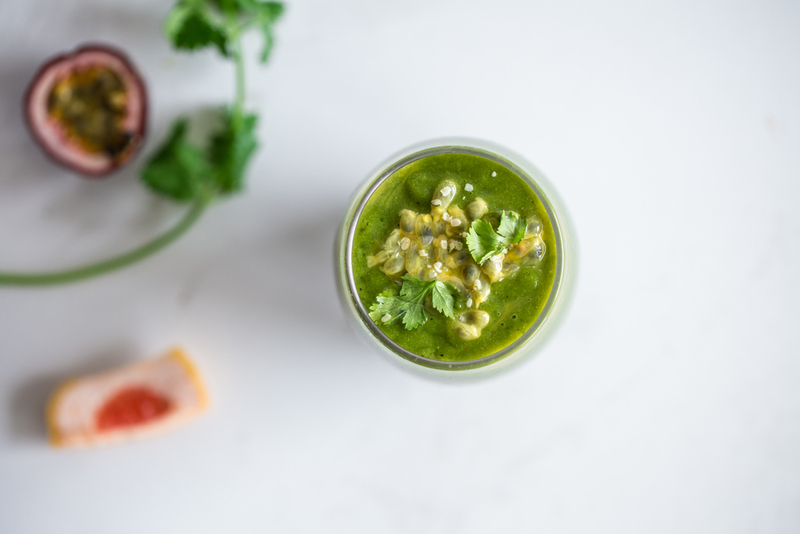 I find that the citrus and cucumber gives enough liquid to get the smoothie going, however you may need to add some filtered water (or if you prefer a thinner consistency). Stir in passionfruit for an exciting texture. * If you don't have an affinity for coriander/cilantro, simply increase the amount of greens. Drink or slurp mindfully and enjoy!